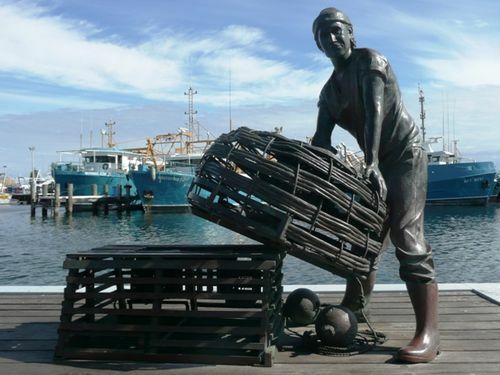 "The Jetty" commemorates the local fisherman who started the fishing industry in Fremantle. The memorial incorporates 12 timber columns, the names of 608 fishermen who pioneered the industry in Fremantle, and two bronze sculptures. The names listed are taken from pre 1947 fishing license records but all those who have participated - both men and women - are equally honoured for their pioneering spirit and the hardships endured. Western Australia`s early fishermen worked hard and often in dangerous conditions. They helped create an internationally respected modern industry and gave Fremantle much of its character and charm. There are two life-size bronze sculptures of fishermen, a map of the coastline showing traditional fishing grounds and a short history on the industry`s history. Twelve timber columns on the jetty carry the names of the 608 fishermen who pioneered the industry at Fremantle.